The Argentine author Jorge Luis Borges (1899-1986) has been a perennial favorite of mine since I discovered the Penguin Modern Classics edition of Labyrinths in the late 1970’s, sometime after another fantastic and comforting book, the Bhagavad Gita, came into my youthful possession. Among my most cherished and frequently consulted books are my first editions of the three large volumes of Borges’s selected fiction, non-fiction, and poetry published by Viking in 1998 and 1999. While these are somewhat comprehensive, and collect all the most essential writings (although The Book of Imaginary Beings, alas, is missing), I still have a number of volumes of his works that predate this admirable effort. 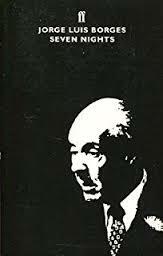 In addition, I have other rather ancillary works by and about Borges. This collection of talks given by Borges over seven consecutive nights in 1977 is one of these, and covers most of the author’s deepest preoccupations, from Dante’s Divina Commedia to the 1001 Nights, the Kabbalah, Buddhism, Nightmares, Poetry and Blindness. It’s a short volume, and I have picked it up a few times over the years to read one of the lectures, only to find myself reading the whole thing through again. My edition is the Faber and Faber edition of 1984; New Directions has an edition currently in print. The metaphysics of these topics preoccupied Borges, and each is in some way a mask of infinity, as are mirrors, labyrinths, and libraries, three other preoccupations that he had failed to exhaust in his other writings but did not address here (at least not directly, though references to them are scattered about within these pages). The fascinating thing about Borges was his ability to seamlessly meld the true and the fantastical in his writing, and more than once I’ve tried to run down a reference made in one of his pieces only to find that the source doesn’t exist, or (to give the author the benefit of the doubt) is maddeningly elusive. I’m not sure there is much of that in these lectures, but you never know. Some of his assertions are charmingly antiquated, and there is no topic that Borges could discuss that did not redefine the topic through his lens – that is to say, Borges did not necessarily write of the Kabbalah as it exists in the scholarly world (despite obligatory reference to Gershom Scholem), but of the Borgesian Kabbalah. While one can certainly say this about any author, Borges had created such a comprehensive and idiosyncratic metaphysical world view that each of his preoccupations informed and redefined the others in a holistic sense. For his readers, Borges is as much defined by his literary worldview as Kafka is of his. It is as if his blindness, which – according to the lecture here – progressed by degrees from birth, served to spur the creation and growth of an interior universe, defined by the simultaneously pedantic and imaginative mind of its creator. In his lectures and writings, Borges gave us glimpses into that universe. For the uninitiated, this would be a good introduction, and a springboard to his other works.